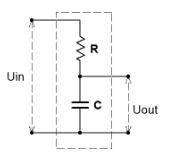 To convert a PWM signal to a DC voltage it must be filtered with a low pass filter. How can you know which cut-off frequency should be used and how do you calculate the values for the resistor and capacitor belonging to that cut-off frequency. I do know that the cut-off frequency needs to be much higher/lower in comparison to the PWM signal, for example a factor 100 lower/higher. The PWM frequency on the Arduino is about 500Hz by default, so you want your -3dB frequency to be below that. How far below? That's subjective. Lower gives a smoother output but a lower response speed. Since you want DC out then you can afford to go very low, unless you need it to respond to changes in the set point quickly. Not the answer you're looking for? Browse other questions tagged pwm resistor capacitors calculation or ask your own question. How close to 5 kHz can I set the PWM frequency on an UNO pin 11?